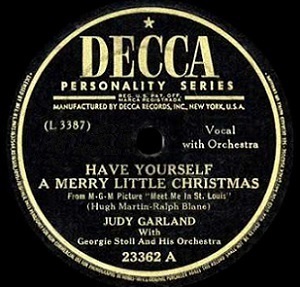 The Nineteen Forties were significant for many things, from a World War to the arrival of television in American homes, but among the more lasting additions to the cultural side of the equation was the arrival of more Christmas songs into the popular canon than probably any other decade in history. I say “probably” because I haven’t done the song by song tally but if another decade beats it in terms of sheer numbers none can compete when it comes to the impressive array of enduring Yuletide classics. From White Christmas to Rudolph The Red Nosed Reindeer, 1940’s music has – in one very distinct way – remained in the mainstream far longer than most bygone eras as a result of this seasonal phenomenon. Rock ‘n’ roll also began in the late 1940’s of course, maybe the ultimate significant addition to worldwide culture that decade, and as we’ve already seen quite a few rock artists have contributed Christmas records of their own during this time, many of which were big hits. But unlike their pop brethren most of those rock entries haven’t remained on the annual holiday playlists in the years since for one reason or another, almost as if the nostalgia associated with the songs of that era only can encompass one brand of cultural heritage. So it’s up to us to remind those who still listen to Bing Crosby and Perry Como crooning to them while chugging eggnog next to the fire each December that there’s plenty of other options available if you want to conjure up a 1940’s Christmas. Any way you looked at it Little Willie Littlefield’s rise from club act to national recording star had been meteoric. In the fall of 1948 he’d first signed with a local Houston label which was started specifically to showcase him and now just a year later he was recording for a prominent Los Angeles based company for whom he’d already delivered two huge hits in his first two releases. Oh, and he did this while he was young enough to still legally require his mother’s signature on a recording contract! Modern wasted no time in getting him in the studio as often as possible to take advantage of his rising popularity, cutting a remarkable six sessions over six months including one double session, giving them such a stockpile of songs that they began to rush the pace of their release schedule to take advantage of the interest Littlefield was drawing. Normally that might not be the best idea but when it came to this Christmas record they might not have had much of a choice. As Littlefield’s first release for the label, It’s Midnight, rose up the charts in late summer Modern Records had almost certainly already decided upon Farewell as its follow-up scheduled for October. Of the songs they had in the can from their two summer sessions (June and July) it was the most obvious choice since it was close to the hit in both tempo and mood and the belief is you don’t deviate too far from what was successful. Besides it was a good song in its own right and audiences agreed when it too hit the Top Ten in November. The problem was that didn’t leave much time for a third release before the end of the year, particularly since they had a Christmas song at the ready which had only been recorded in mid-September. They could’ve released it as the B-side in October – and maybe that would’ve been the best option – but their thinking probably was to use their initial follow-up to his breakthrough to try and firmly establish Littlefield as a reliable hitmaker and the fact is that Christmas songs, even HIT Christmas songs, were sort of a commercial outlier rather than a confirmation of someone’s ongoing viability. Now they were in a bit of a bind however. Farewell was meeting sales expectations right out of the gate, solidifying his standing with the rock audience, but that meant that the time to strike with the Christmas song was becoming extremely limited. Their choices were to either wait a full year, by which time Littlefield’s star might have already faded and risking the chance a year old tune might sound dated if styles changed in that time, or if they wanted to avoid that possibility and strike while the iron was hot they could rush-release it now and hope the interest in him which was soaring as we speak would support a second single on the market at the same time. They chose the latter route and were promptly rewarded for it. 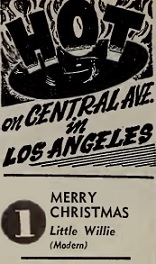 Although Merry X-Mas didn’t chart in Billboard magazine, which by virtue of its longevity as a continuing publication has become the default measurement for determining hits, the fact is this record WAS a hit and a big one at that, topping the Cash Box listings in Charlotte, North Carolina and in Los Angeles on opposite coast. But of course as soon as it peaked in late December the window for it closed and the record dropped off those charts overnight. So that’s the story behind it and stories are always needed to set the scene, but as always the more important issue once that historical context gets established is finding out what the record itself has to offer. Downbeat Christmas songs are nothing new, in fact for something that is always marketed as such a joyous holiday it’s surprising how many of the season’s most immortal songs are actually fairly despondent. The odd thing about this one however is the lyrics themselves are somewhat optimistic, even though the sound of the record is pretty gloomy. The downbeat mood the music conjures up is certainly the right one for the occasion since Littlefield is singing Merry Xmas to his estranged girlfriend, but unlike a lot of songs – holiday or not – featuring this dilemma, Willie doesn’t seem emotionally distraught about it, or on the verge of suicide if she doesn’t return to him. His voice is certainly far from excited about any visits from Santa Claus but he’s not whining about the reasons for their breakup, making excuses to protect his self-esteem, nor is he sending threatening messages in his Christmas card to her, vowing payback for leaving him. If anything Littlefield sounds resigned to spending Christmas alone even before he knows for sure what the outcome is going to be. There’s little to go on for us in the way of back story to be able to offer him either some reassurance that they’ll soon be back together, or to offer him a ride home and a shoulder to cry on. We get no hint of what may have happened to split them up, nor any sense of when this event occurred, whether a few weeks ago or even a few years back. What we do know, or can at least sense by his vocal serenity, is that whatever the case may be he’s come to accept their parting of the ways and as a result he actually sounds genuine in his well-wishes to her, even if he does include a few not so subtle hints that his own Christmas would be better spent with her at his side, hoping – but not begging – for sympathy should she hear this lament. The music accompanying this doesn’t need to be told any details of this story because it sounds as though they’ve shared many a night together – his piano and him that is, picking out reflective melodies, almost bordering on the morose, and then adding a few fills that are designed to give the illusion of better days around the corner. The two are in lockstep throughout this, one feeding off the other, somehow keeping the flame burning without much oxygen. Littlefield of course is highly capable for both of these tasks. He’s got the vocal equivalent of hangdog expressions down pat with his Amos Milburn inspired tone and delivery, and his lightness of touch on the keyboard is a perfect compliment to that wistful state of mind. It may not have much in the way of materials but it’s constructed with an admirable efficiency and Willie hammers each nail into place with the skill of a master craftsman. As popular as Littlefield was now shaping up to be however it still is a little hard to imagine this being anything more than a curiosity for those who jumped at the chance to hear whatever he was laying down. Once heard there’s not much incentive to go back to hear it again and again, as most Christmas songs, or any new quality record for any season for that matter, normally has you wanting to do. The reason isn’t because of the inherent sadness in Merry Xmas, as stated there are plenty of Christmas songs that are pretty overt about their misery, from Blue Christmas to arguably the most maudlin of them all, the wartime tearjerker I’ll Be Home For Christmas. Even Mariah Carey’s buoyant sounding All I Want For Christmas Is You expresses these same basic sentiments, though it does so by wrapping the song in a much more upbeat package. Then there are those classic songs like Have Yourself A Merry Little Christmas which is ostensibly filled with optimism and happiness, singing about how ”from now on our troubles will be far away”, yet all while sounding as if the bank just foreclosed on their home on Christmas Eve. So obviously there is no formula that has to be strictly adhered to when it comes to making a Christmas song that will have you coming back for more year after year. Yet something about Littlefield’s Merry Xmas sounds ephemeral by nature, giving us just a momentary glimpse of people we don’t know well and thus can’t feel fully invested in their problems. By not getting into specifics, yet also not presenting their problems as something more universal as other more lasting songs have done, Willie manages to keep himself and this song purposefully detached from our feelings and thus deprives himself of our sympathy. We may hope he and his girl find their way back in each other’s heart snuggled under the mistletoe by Christmas morning but by the time we’re opening OUR presents we’ll have forgotten all about their plight and be focused on what we’ll ever do with the 32 pair of mittens and the twelve foot long scarf that we got from our knitting crazed aunt with too much time on her hands. Littlefield, his former flame and his record vaguely referring to both will be a distant memory by then. Maybe the best lesson this offers us is showing the difficulty all songwriters have, whether back then or today, in coming up with new Christmas material and why most artists wind up trotting out new renditions of the same old standards every season. Christmas songs that try and capture the elusive feelings of the holidays, be it the overall joyous spirit and easy smiles that seem to come more readily to people each December, or the ravenous greed of the children looking forward to their haul of gifts, or the nagging underlying sadness of a time that’s best spent with loved ones who are no longer here, are exceedingly tricky to pull off. If you’re too cheerful in what you present you come off as sounding cloy and patronizing. If you’re too direct in your imagery then you aren’t leaving any room for personal interpretation. Too vague and you risk missing your emotional mark altogether. Too specific in the causes for your sadness and you won’t connect with those who aren’t experiencing the exact same symptoms for the exact same reasons. Now toss in the nostalgia factor that was already taking shape as the 1940’s drew to a close when even though most of the Christmas recordings we’ve come to cherish over the years were but a few years old at most, and you’re almost in a no-win situation. Littlefield’s efforts here can’t be criticized, he’s even basing the general feel on one of the first legitimate black Christmas standards, the Charles Brown-led Merry Christmas Baby by Johnny Moore’s Three Blazers, itself just three years old and sounding as if its being viewed through the same hazy gauze that classic made famous. But whatever the key ingredient is to make something seem eternal Merry Xmas doesn’t have it. There’s nothing to find fault with here, but nothing to really lavishly praise either. It doesn’t try and reach too high but still can’t manage to surpass even those modest aims. It’s good enough to appreciate but hardly good enough to notice its absence if a few years go by and you don’t hear it in your own Christmas mix. In the end that’s the biggest test of a Christmas song and while we’re glad that rock ‘n’ roll wasn’t shying away from trying their hand at coming up with a few to stick under the tree, we just have to face the fact that there’s always going to be a few presents that are forgotten soon after they’re opened and this is one of them. Oh well, as they always say about gifts, it’s the thought that counts. 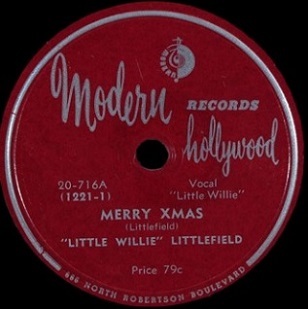 Leave a reply on "Little Willie Littlefield: “Merry Xmas”"